1. Can I use the voice over for all types of media? Our standard terms regarding ownership is referred to as a "Buyout." Under a buyout, you will own all rights and may use the Japanese voice over for all media for eternity, excluding all forms of commercial television. The voice talent is not prohibited from performing voice over, for any medium, for other products, services or other offerings the same as or similar to the products, services or other offerings provided by your company, business or service and/or the company, business or service depicted in the video or other media accompanying the voice over. If the voice is to be used on any form of commercial television, additional payment terms may be negotiated. If you desire the voice to be exclusive to your product/service, you may opt for "Restrictions" on the voice, and additional payment terms may be negotiated. Complete details about usage are stated in the Terms & Conditions statement that you will receive during the project arrangements. 2. Can you say the brand name in English? English words – such as product and brand names – can be changed to their corresponding Japanese ideograms, and the pronunciation will be correct. English words should be written using their corresponding Japanese ideograms. Please consult your scriptwriter. Read more about English words and their Japanese pronunciations. 3. Can you sync the voice over to my video? Yes. We can provide a single audio file that is synced to your video. That is, the Japanese audio playback from :00 will match the video from :00. The Japanese audio file will sync to the scenes in the video. Then you could simply add the audio track to your video track. In order to sync in this manner, the Japanese-language script you provide must indicate the length in seconds/minutes of each section of Japanese text to be recorded (e.g. :17 sec. ; 1:09, etc) and we will need the video. It would be helpful to also have the English script. There is no extra charge. Please provide the video. Generally, syncing is included in the narration fee. 4. Can you translate my script to Japanese? If your script is only a few sentences, such as a telephone on-hold message script, we can translate it. For longer material, we don't do translation. 5. Do the voice directions I specified fit the Japanese style? We will tell you if we think the voice style, tone and speed you requested is unusual for the Japanese market. If you're not sure of the voice approach for your project, we can suggest appropriate voice moods that work in Japan. For example, you may have a video with a voice over in your native language that is suitable for your intended audience. Although you might want the same voice style in Japanese, it's possible that voice style is not common for your particular type of video. We'll tell you before the recording session begins and you can decide how to proceed. 6. How can I know if the Japanese in my script is correct? In our experience, we usually find various errors in Japanese scripts provided to us. We often find incorrect usages of Japanese ideograms that changes the intended meaning. So to be sure your script is ok, we offer proofreading and rewriting services. We also offer several paid proofreading options. After you receive the results of our free script check, you can proceed at your discretion regarding script corrections. Complete details about our script proofreading options are stated in the Terms & Conditions statement that you will receive during the project arrangements. Read more about proofreading. 7. How many Japanese voice talents do you have available? Two native Japanese males and two native Japanese female voice over professionals are available. Read about the Japanese voice over talents and listen to their demos here. 8. How soon can you do it? Time to completion is dependent upon the availability of the voice over talent that you selected, and the details of your project. We do our best to produce projects in a timely manner. 9. I don’t have a script in Japanese yet. How can I know the price? An estimate can be made based on the number of minutes of Japanese voice over, or on the number of words in the corresponding English script. Request a price quote. Normally, for most type of productions, the cost for Japanese voice over is based on the number of Japanese ideograms to be recorded. 10. Is the download link in my email broken? You may have received an email from us that contains a link that will download audio files in the form of a "zip" file or "mp3" file. If you clicked a link in that email and an error web page appeared, you may have clicked only a part of the full link. In your email application, the link has become a "broken link." If your email application has not displayed the web addresses as active links, or if your email application divides a web address into two lines, please copy and paste the full address into the 'Address' or 'Location' bar in your internet browser and press the Return key on your keyboard. View larger broken link image. Letsnarrate.jp is my original website which promotes my English and Japanese voice over services. All downloads are managed via Letsnarrate.jp. 11. Should the Japanese script be in a special format? Conspicuously indicates the sections of text to be recorded. Indicates text that is not to be recorded, and other special instructions. Spells out scientific symbols, other symbols, and ambiguous characters in Japanese ideograms. Has numbering for each section of Japanese text to be recorded. Indicates the length in seconds of each section of Japanese text to be recorded. Does not contain text in parenthesis. Does not contain any English words (e.g. words spelled using the Roman alphabet). English words, such as product and brand names, should be written using their corresponding Japanese ideograms. Product names, abbreviations, acronyms, symbols, numerals and the like can always be written using Japanese ideograms. It's important that all such English words be converted to Japanese ideograms so that we will know exactly how you want the words pronounced in Japanese. Read more about English words and their Japanese pronunciations. 12. What are the Terms and Conditions? I will send you an email that contains our complete Terms & Conditions information. 12. What is the translation of the Japanese text on some of your website pages? Two pages of this website contain Japanese text. The Recruit page has information for Japanese voice over talents who are interested in joining my team. The Company page is similar to the company page which is common to Japanese websites. 13. What should I initially provide so you can better understand my project? The video or storyboard, if possible. The Japanese script as a text document. The deadline for delivering the audio file to you. Submit your script and request a price quote here. 14. When did you start offering Japanese voice over services? 15. Why do you have only four Japanese voice over talents? There are thousands of professional voice over artists in Japan. But it is nearly impossible to find a Japanese voice over professional in Japan who has a home recording studio, voice over experience, and the audio engineering skills necessary for meeting industry standards for audio quality. The home recording studio trend — voice over being provided by a freelance voice talent who has a home studio — is common in North America, Europe and other countries, but is not common in Japan. In Japan, there is no demand for such home-studio services. This is because voice projects in Japan are arranged using a voice-talent casting agency to find a narrator (voice over talent), and then the client, agent, producers and others attend a recording session in a full-service studio. This traditional system does not require the voice talent to have audio editing skills – the studio engineers handle all the post-production. The four voice over talents I have listed on my roster are the ones I've found who do have home studios and the combined skills necessary for meeting industry standards for audio quality. Read more about finding a qualified Japanese voice over talent. 16. Why does the link you sent me to download my audio open a page on the website "www.letsnarrate.jp"? Letsnarrate.jp is my original website, which promotes my English and Japanese voice over services. 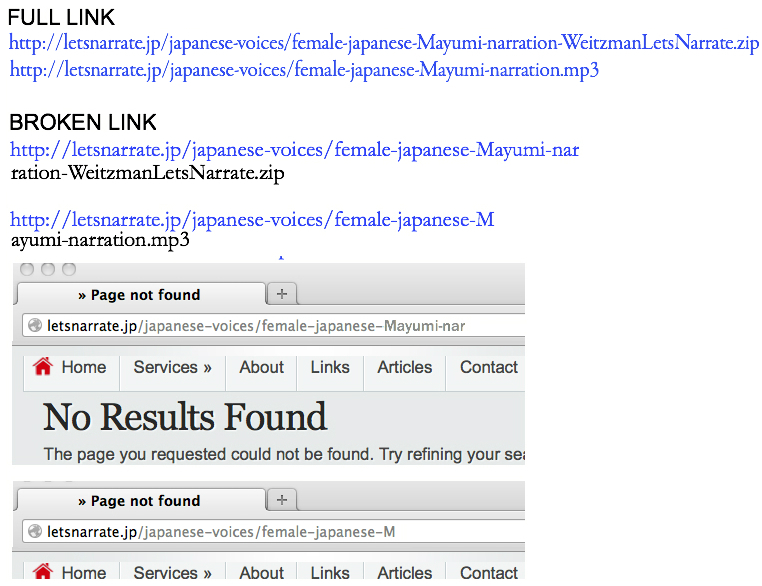 All downloads for japanesevoiceover.jp and letsnarrate.jp are managed via letsnarrate.jp. 17. Why did you say the Japanese voice demos on this site were recorded in the talent's home studio? On the Demo & Profiles page, I wrote "All of the demos on this page were recorded in the talent's home studio." I point this out because voice over talents have a lot of voice samples to choose from, so some talents online might choose a voice over that was not recorded in his or her home studio, but instead recorded in a full-service studio and mixed and edited by professional audio engineers. Thus, the audio you receive might sound different from their voice samples. I guarantee that the audio quality you hear on my site is the same quality you will receive for your project. Contact - or use this easy form. Need native English voice over? For details about English voice over by Mark Weitzman click here. Learn what to look for when hiring a Japanese voice over talent. Read helpful voice over articles .